On Friday night, Donald Trump signed an executive order arbitrarily banning arrivals from a swath of majority-Muslim countries, to cataclysmic effect. 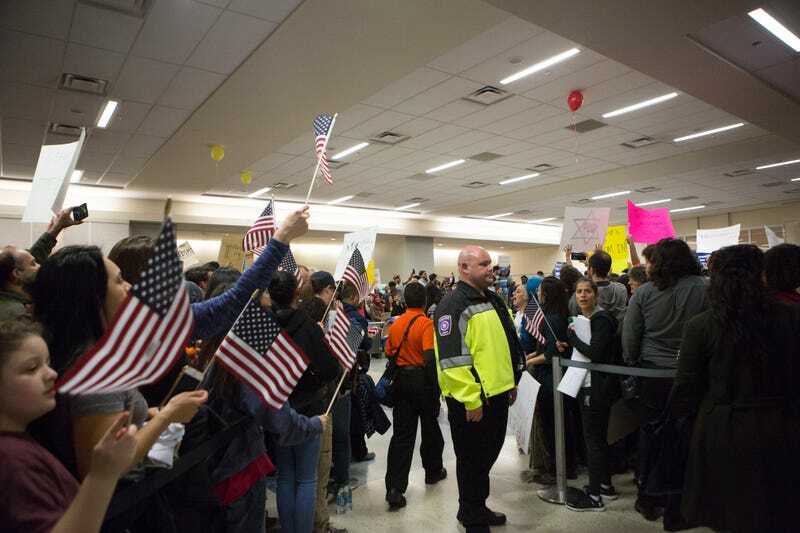 The heroic lawyers at the ACLU and elsewhere worked long into the night to grant those detained a temporary stay, but dozens of people remain trapped at airports around the country. In light of these facts, it’s incumbent on employees—the police, Customs and Border Protection agents, ICE officers, and everyone else with a hands-on role in carrying out the ban—to resist. Simply don’t do it. It’s an extraordinary ask, and not everyone is in a position to potentially lose a job for their morals. (There are more surreptitious methods of refusal, like that employed by one airline employee who told the Guardian they’re just looking the other way: “We’re turning a blind eye—we’re pretending we haven’t seen the Syrian passport.”) But these are extraordinary times, and you don’t have to do it alone. “Policies don’t execute themselves by magic. They actually have to be carried out by people,” he said. “This travel ban...is not just horrific and unwise, but it’s illegal. It’s requiring the people who execute it to break the law.” If you’re a government official—CBP, ICE or otherwise—and you’re being asked to do something that violates the law, he said, just don’t. Daniel Epps is an associate law professor at Washington University. You can reach him at (314) 935-3532, or at epps@wustl.edu. Leah Litman is an assistant law professor at UC Irvine. You can reach her at (949) 824-9941, or at llitman@law.uci.edu. And Ian Samuel is a lecturer at Harvard Law. You can reach him at 917-803-8609, or at isamuel@law.harvard.edu. Arendt was later criticized for selecting the wrong example for her illustration of apparent normalcy, but the overall thesis remains the same. To those in a position to help, or to disobey, remember that history traditionally hasn’t looked too kindly on those who said they were only following orders. Last February, former CIA director Michael Hayden made waves when he signaled that the U.S. military would likely disobey any ludicrous directive to assassinate the families of terrorists. “I would be incredibly concerned if a President Trump governed in a way that was consistent with the language that candidate Trump expressed during the campaign,” he said at the time. It seemed absurd, back then, that the military would refuse orders from its Commander-in-Chief. But that seems like lifetime ago, and everything is different now. Trump cannot execute his order without the help of his constituents.